As we wrote earlier, at the end of February this year the court in Vilnius ruled in favour of the Vilnius Joachim Lelewel School. New circumstances arose and for that reason representatives of school community issued a statement today, appealing to local authorities to comply with the court’s ruling. According to representatives of school community, attempts to challenge the court’s ruling, which is definite and is not subject to appeal, are unacceptable. “From the very beginning, we claimed that the decision to move the school was unlawful and inconsistent with one of the fundamental assumptions of educational reform – optimization of schools distribution. We have defended and we will defend out children and grandchildren. Law violation and biased decisions are unacceptable. Protracting or searching for any mistakes in irrevocable court’s decision will not affect our determination. We do not agree with the statement that the return to Antakalnis is not possible. We will seek to restore the initial situation, with two schools – the Lelewel school and the Wiwulski school – operating in Vilnius. 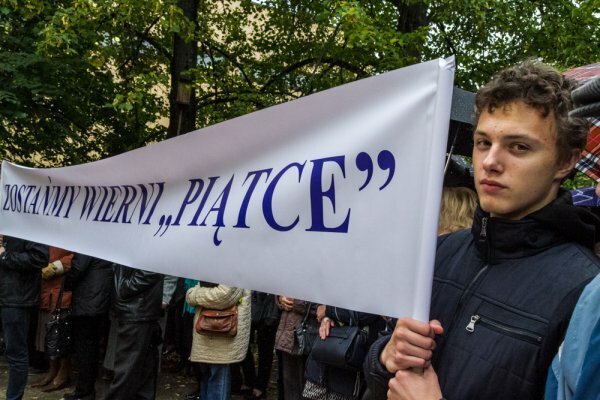 Both schools should exist to preserve tradtition and educate citizens of the Lithuanian state” – wrote representatives of the Vilnius “Five” school community in the statement. They underlined in the statement that the idea of education is not only based on the proper students distribution. “We would like to remind the current Vilnius authorities of the fact that School means – except children distribution – education, culture, law, traditions, community, non-formal education and upbringing. The local government has an obligation to maintain school buildings, including renovation of the buidling at the Minties Street, and should not try to use it to bribe parents community. We will strive for the right to have a school in the vicinity of our homes. We do not accept the way the problems are being solved – quickly and hastily, at the expense of out children and grandchildren. We would like to underline that the issue of moving the Lelewel School from Antaklanis concerns the entire Polish community in the Vilnius region” – they stressed. Defenders of the Lelewel School are very determined to fight and claim that they are not going to give up. “We will seek to restore the initial situation. We want to have two schools in Vilnius – the Lelewel school and the Wiwulski school – which provide all-round education with 12 grade levels. Both schools should exist. Parents who appealed the decision of the Vilnius local government and won the case in the court with the help of a lawyer, will have a consultation next week. Then we will agree on the next steps aimed at defending rights of our children” – stated authors of the statements. Representatives of school community insist that the problem of unused rooms is easy to solve. They might be used to implement non-formal education projects, or for sports, cultural and other purposes.